I had a pretty epic month in October. I ran my first 50 mile race in a time that I was more than happy with. I then ran my fastest 50k race so far on tired legs! And just two weeks before the 50 miler, I ran another tough 50k where I came in 3rd overall! Oh, and I ran to the top of a couple of mountains as well! Actually a really fantastic month! I think my blog needs more pictures of wipeouts. They are unfortunately harder to find than I'd like!! So anyways. It's November. I feel like BLAH. Part of it is I'm STILL somehow recovering from the Pony Express and Goblin Valley. I'm tired. My head hurts. I think there is some Seasonal Affective Disorder going on as well... which is SAD. But I've still been able to get out and do some fun things. I watched the kids while my amazing wife ran the Moab Trail Half Marathon - she did awesome. And we saw Arches National Park, and I was able to hike/run 6 miles seeing some amazing arches like Landscape Arch, Partition Arch, Navajo Arch, and Double O arc. 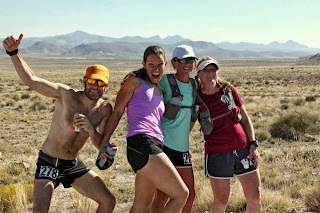 Definitely somewhere I would like to go back to and maybe put together an adventure 50k!! (I need to modify that route a bit probably...) At only $10 for a week's entry to the park? That is NOT BAD! Beautiful area! I really hope to go back soon! After getting back from that awesome family vacation/adventure, I was tired and slightly sick for a few days. That's not fun. Finally on the next Friday I got out with Matt to hit another peak, Ben Lomond. Even BETTER than that, the day before I found out I had won a GoPro Hero 3 Black Edition in a work Benefits Raffle! Yeah I am still figuring some stuff out with it. Ben Lomond was great - even though my watch paused and messed up the total (should be 15ish) a bit. The next day I went up to the Steed Creek cliffs again with Professor B, the next door neighbor of MVH who is trying to get into trail running more. I was definitely slow after Ben Lomond! Last week I finally made it back out in the morning for a run up Farmington Canyon with the Newman Group. It is very nice to run 11 miles in the morning before work! Friday morning I got up early and drove up to Antelope Island to bag the big peak on that Island - Frary Peak. I went with MVH who had just won the Frary Peak Climb 10k Race the weekend before. It was nice to get him beyond where the race turned around and to the actual peak. With the snow and the rain we took almost twice as long round trip as he took on his race! 7 decent miles on a trail I'll definitely have to do again! Finally on Saturday I went with my wife up the Steed Creek Trail again - this time up the Hornet Canyon split to a cool little canyon that supposedly has a waterfall when it is runoff season. Of course, we decided to do it in a blizzard! Almost 4 miles. It was very slippery and we had a few slips and falls, my wife came down on her hand a bit hard and we hope nothing serious happened to it - but after 2 days it is already greatly improved. Yikes. I took my GoPro but haven't had time to finish the video. Hopefully I'll finish that soon and get it up! While driving out to Antelope Island MVH and I were talking about how there should be a shorts contest for the winter amongst the Wasatch Mountain Wranglers. So I put it out there and had some good response. So November. It's just over halfway through and it definitely started with a big BLAH feeling. Somehow it was awesome too... I mean looking back at this entry and it's been an amazing month so far! I guess that BLAH feeling is being overcome! The Struggles of November are showing their fruits as some great memories, and dedication to keep on going! Life is amazing. Live it amazingly! I somehow decide to run a 50k eight days after my first 50 miler. And I made that decision just a few days after that race! My brother was going down to emcee the Goblin Valley Ultra, and through TrailandUltraRunning.com (TAUR) had a race entry that, since he was emcee-ing, he wouldn't be able to use. Free race in Goblin Valley? Awesome! Timing-wise, just a few days before, Goblin Valley had been in the news across the world because a few dummies decided it would be a good idea to post a video of themselves knocking down one of the ancient rock formations. "Don't knock down any Goblins!" Right. I'll keep that in mind! Friday afternoon my brother and I drove down in his new FJ Cruiser to Goblin Valley - unsure if we would have a campsite or if we'd be sleeping in the car. I guess we were supposed to have a campsite - and those campsites look pretty nice - but they were full, so the rangers told the Race Director that we could sleep at the Overlook, which is normally NO CAMPING. It was really cool to set up the tent and sit outside looking at the amazing stars in the sky - with no light pollution whatsoever. It's crazy that up to two-thirds of people can only see some of the stars... and that some people have never seen the full brilliance of the night sky due to this light pollution! We just sat in the dark and watched the shooting stars. It did remind me that maybe I should look into a lasik type eye surgery as some of the details just weren't there. Getting older. Blah. It was cold when we went to sleep, but thankfully not as cold as it was last weekend at the Pony Express! THAT was bitterly cold. I decided to start the race in the morning in a tank top and Matt's Pearl Izumi sleeves, as I knew it would be warming up and I didn't want to have to carry too much. I was going to run with just a handheld bottle (and I probably could have) but after hearing that the Race Director had only ever done a road marathon and some half marathons, no ultras, I realized that this was NOT going to be normal Ultra-type Aid Stations but instead water, electrolytes, and gels of the road type races! So I took my Ultraspire Spry just in case. This also allowed me to take my ActionCam, but I haven't been able to process any video yet. I started off running with Kreuzer (you might remember him from the Millcreek 50k, Olympus, and Olympus again in the ROCKS ROCK video!) and his cousin Roxy, an experienced Marathoner but first-time Ultramarathoner! We headed away from the start and down the ROAD (blech) past the campground, and then onto an ATV trail for a couple hundred yards and back onto a road. That road continued for the next six miles... And then it turned into a dirt road near the Wild Horse Canyon outside of the Goblin Valley State park. There were a few minor climbs but nothing too bad, and we kept a pretty decent pace until the 50K turnaround. Just before the turnaround my body started to give me some signals that it was TIRED. I was definitely feeling the effects of 50 miles from the weekend before! But I was able to stick with Roxy until about mile 17, and Mark until 19. I kept moving slowly until a girl (Her name was Jenny) who was moving really well passed me, and I decided moving faster would hurt just as much as moving slowly, so I kicked into a higher gear and blew by her and a few others and got within 200 yards of Kreuzer again, then my feet and hips just quit working - they didn't like the pavement. Jenny passed by me again and ultimately passed Kreuzer as well, running really smart and strong. It is always awesome to see people pull a good smart race together! At this point I just pushed myself into a 200-300 steps of running, 25-50 steps walking all the way back to the turn past the campground and up to the Overlook Parking lot. From the parking lot they direct you down to probably the best part of the race - about 3/4 of a mile through the Goblins. I could actually run again since I wasn't on the pavement! Following the Halloween Candy Bowls (rocks, no candy, so sad) you weave through some of the goblins until you get to STAIRS at the END of the RACE. So mean! Then to make it worse, you cut off the stairs and run straight up the hill around the fence, then across the parking lot to the Finish line. Official time 4.52:20, 13th place in the 50k. So that's a 50k PR for me. I think if I hadn't run 50 miles 8 days before - I could have cut off 30-45 minutes off that! It was a bit short for a 50k, but it was still a lot of fun. Then we had the long drive home! 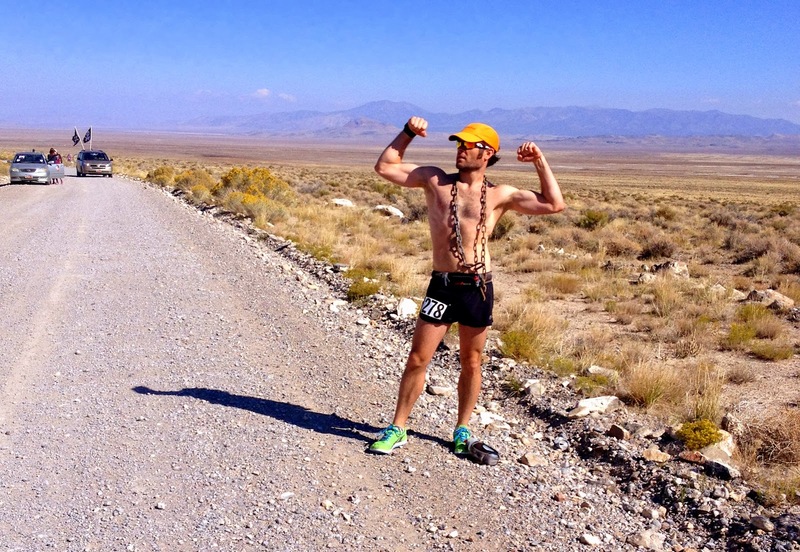 Next up - Kakes runs the Moab Trail Half Marathon! Words cannot really describe how I feel just days after running 50 miles. But of course, since this is a blog, and that's made up of words (and PICTURES and VIDEO too thankfully! ), I guess I'll just do my best. Unfortunately I still had to make it through the night! My nerves were definitely hammering me hard! We got the campfire going and threw our tin foil dinners (partially pre-cooked by my everthoughtful wife!) in to warm them up - and WOW were they delicious! I am a lucky man to have such a gourmet chef of a wife! The moon popped up super bright in the clear sky - and it kept getting colder and colder! We crawled into our tent hotel and into the cold sleeping bags - and whoever was last in didn't zip the tent door closed! One of the cool features of our tent is that it has a bendy pole inserted into the door flap that turns it into a great little door. Because we didn't stake the tent down (lots of stuff inside) and the sloping of the ground, the door didn't align to velcro properly. So there was an inch or two gap that just let cold air in all night, but nobody wanted to get out to close it! Bad idea. Seriously lowered the temperature in the tent by 10-15° easy. I was scheduled to start at 7am. It was dark, the bright moon had just gone down behind a mountain, and the temperature was just below freezing! When I finally changed in the sleeping bag and got out around six, we heated up some pre-cooked bacon in tinfoil and I ate some of that and a banana. I think making my self eat food when I normally would shrug it off was very important in my energy levels through the long day to come. Shivering at the starting line! All the COOL kids wear pirate pajama bottoms! And then take them off during the count-down! I ran very near the front of the 7:00 group - with a couple hundred mile runners for a while (they ended up taking 3rd and 10th in the 100!) but they slowed down to maintain a more normal pace. I saw both of them a few more times as they passed me and/or I passed them. Leap frog can be fun! It was like it just disappeared! As the sun started to come up things started to feel a LITTLE warmer, but I heard a car tell their runner that the temps had gotten COLDER! Luckily my legs felt fine, and my core felt warm, but my fingers took a while to warm up! It was great to have my brother in law Ben riding alongside me on his bike - he caught up to me about mile 10 - and it was always wonderful to see my wife, my brother, and my sister in the van with the Jolly Roger flapping in breeze, showing me where I could find my reprieve. Like last year, when I was crewing and pacing, my crew danced and played music and cheered for all the runners who passed. It was their awesomeness that made them win 'Best Crew Car' - Oh yeah! I'm sure the pirate flags helped! Somewhere between mile 22 and 25 I caught up to fellow-first-time-fifty-milers-and-Altra-wearers Travis and Francesco. 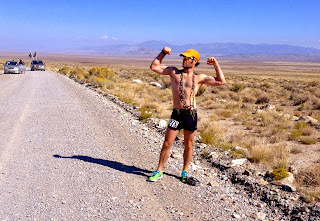 Travis also ran the Buffalo Run with me as his first ultra/50k, and Francesco was with us on/in that AWESOME Olympus trip/video from this past winter. We shared our Swedish Fish and continued on. I think my crew helped me out in my strength and ability to catch up to these guys who had started an hour before me. Misha got out on her bike and rode for a bit, and we hit one of the curves in the road and then a little hill when we hit the Marathon distance! Even with pacing myself to slower than normal, I think I PRd my marathon distance a bit... At least Strava thinks so! Sounds like time for a foot rub and a change of socks. At Mile 28.4, and my goal was to be at least a marathon before the 8 o'clock speedy folks caught me, I was passed by my first 8 o'clocker. My good runnin' buddy Matt Van Horn who was in the 100 mile race was KILLING it and passed by, talking for a few seconds before saying "Well I gotta keep my pace, See ya!" And off he went! This was about where I caught up to Kim (in the pic above with MVH and Matt, taken by my crew), a friend of ours who we first met last year when we danced so awesomely for her (and everybody else) - we reconnected a few weeks ago at the Dugway Run where she was with our awesome friend Jen... more on Jen later! After 30 miles I was starting to get hot - so like usual, the shirt came off and my wife ran with me for a bit. We also ran into Kim again. Kim was worried that Jen would be catching her too soon. Jen is speedy and I wanted to hold her off as long as possible as well! Held her off we did until around mile 33 or 34 - Kim was staying strong so we got a great picture with all of us before Jen hurried off. I thought that would be the last I saw of Jen before the finish... because these were the slowest miles for me. I kicked a chain in the road and decided it was awesome bling. So I picked it up and put it on. Right around mile 35 or 36 is the one difficult hill of the PE50 - Dugway Pass. My brother started to run at this time, and he said to me "If you want to finish at 9.5 hours, we're going to have to push, and it'll probably hurt!" So we started up the hill and I was feeling good. Now he's on the right I'm almost on the left! My feet were the major offenders a while before this, so I finally broke down and took a couple ibuprofen. I think it started to kick in because I motored up that hill. 8 minutes faster than when I had run with Matt the year before. You get to go DOWN! And as we neared the bottom - I saw Jen, who was starting to cramp up a little bit. We talked with her for a bit but because I was feeling good and moving really well we continued on. I was now looking at finishing with a 9 hour time (and one of my goals was to beat Matt's time from 2 years ago, 9:30ish!) if I could maintain a 10 minute average pace for the last 10 miles, "But it's going to hurt!" Matt said again. Feeling good - smile is a bit pained for sure! About this time we caught up to the now 2nd place 50 mile guy Chris (he had passed me a while back - he started an hour after me) and he was starting to fade some. We talked to him and actually got him moving a bit just by motivation. You turn left just around the rock there in the picture above, and Chris started picking it up again. And really - there was the finish line! Running by the finish line! But unfortunately - I still had 1.5 miles left! At the end of the 50 mile race, you have to do a MEAN .75 mile out and back to reach that 50 miles. Ugh! I felt like I was fading pretty hard, and I kept moving and got my sticker from the turnaround point, then headed back. Matt had stopped at the finish to use the facilities, and joined us again there - and it was good that he did because I needed the cracking whip. I was looking at a quarter mile to go and was sitting at 8 hours and 42ish minutes. If I pushed... I could get under 8:45! I didn't think I could... but I picked it up and dropped my pacers for that last stretch! I crossed the finish line with an official time of 8:44:50. I did it! I met the major goals I was going for! And I finished 6th place overall for the 50 mile race. I definitely could not have done it without my amazing crew, my pacers, my family! Jen came through right after I did (but remember... she started an hour later! ), winning the women's trophy, and 3rd overall! She also beat her old course record by 20 minutes! Amazing! This is not mine! I have a goofy smile! Cool trophy though! Oh and Matt Van Horn went on to win the 100! You can read his report here. Link to Results - Oh, and I'm currently 20th on the all time 50 mile results! Cool! I ran 50 miles. WHOA! And then we went looking for Geodes... We aren't very good at it. Now... Do I run a 50k in Goblin Valley on Saturday - or do Lone Peak on Friday?!? !